Ross Business School Dean Scott DeRue (left) shakes hands with WDI Board Member Ralph Gerson, for whom the new lecture series honors. At its 25th anniversary celebration dinner Oct. 5, WDI announced the establishment of a new lecture series named in honor of the Institute’s longest-serving board member. The Ralph J. Gerson Distinguished Lecture will take place every two to three years to “bring together our community and think about what is going on in the world and what we can do” about it, said Ross School of Business Dean Scott DeRue. Gerson, a longtime Guardian Industries senior executive, has been involved in WDI since its founding in 1992, was an inaugural board member and continues to serve today. 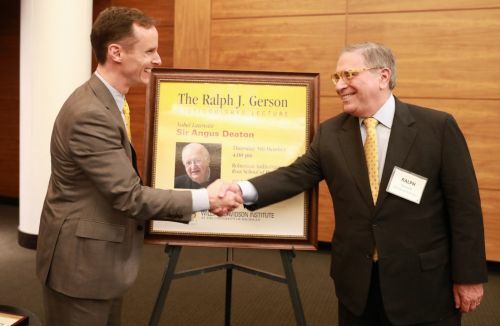 The Oct. 5 talk by Sir Angus Deaton in the Ross School’s Robertson Auditorium was officially named the first Gerson lecture. Afterwards, invited guests which included University of Michigan President Mark Schlissel, Michigan Gov. Rick Snyder, Congresswoman Debbie Dingell and former U.S. Sen. Carl Levin, attended the dinner. 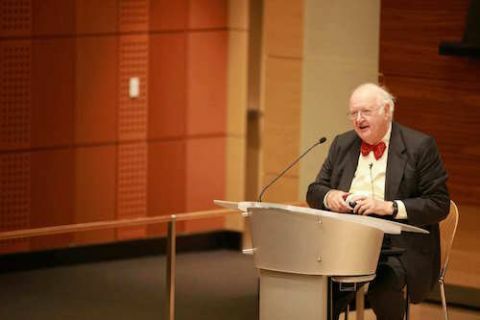 Sir Angus Deaton discusses poverty alleviation Oct. 5 at the first Gerson Lecture. Gerson noted that Levin was present at the kickoff event for the Institute back in 1992 and was pleased to see him at the 25th anniversary commemoration. On behalf of the Davidson family, he thanked everyone for coming and sharing in the festivities. He said in 1992 there was a “tremendous hunger” to learn what was needed to succeed in a market economy. That hunger continues today, Gerson said. At a special reception Oct. 5, Michigan Gov. 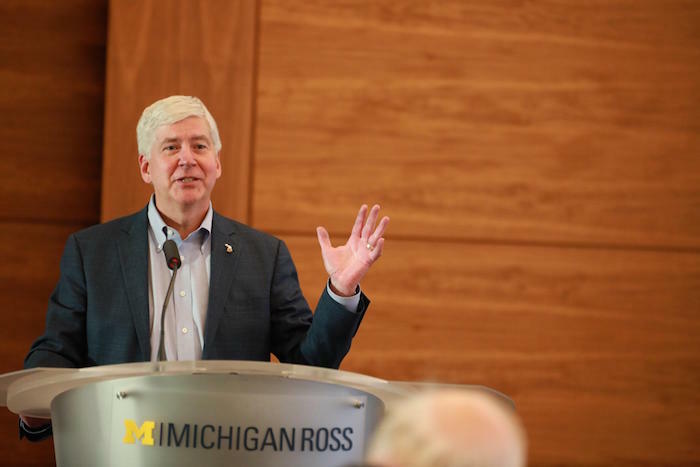 Rick Snyder said as proud U-M alumnus he has been a fan of WDI since its founding.